Yazd, once known as Yezd, is an ancient Persian city famous as the home of the Zoroastrian faith. 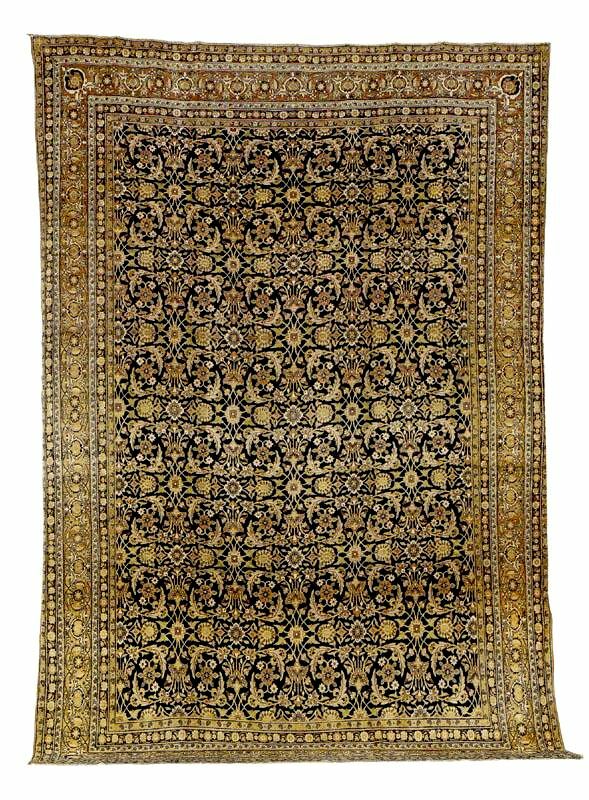 It is east of Isphahan on the edge of the Dasht-i Lut (Lut desert) The city and surrounding area produce carpets very similar to Kerman. 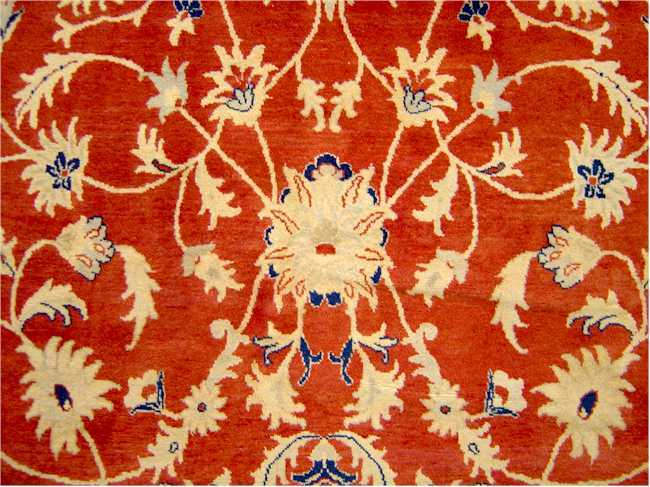 In Oriental Rugs of Yezd Jacobsen noted that most if rug dealers were shown a picture they would call it a Kerman. The term "made in Yezd" means well made in Iran. 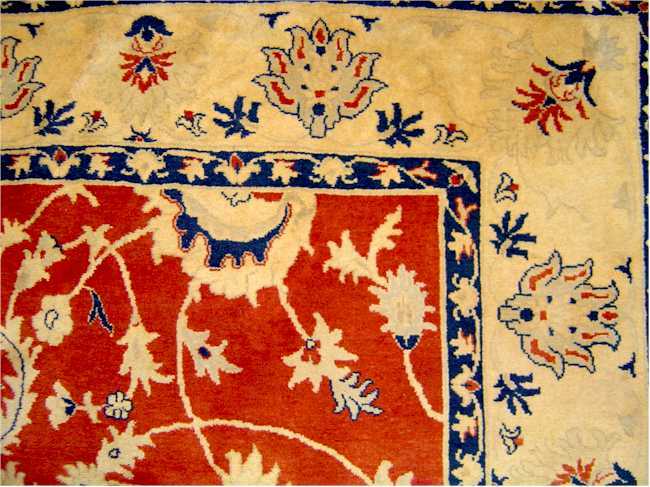 The rugs are typically in the style of Kerman but when Kerman cheapened the weave Yazd did not. 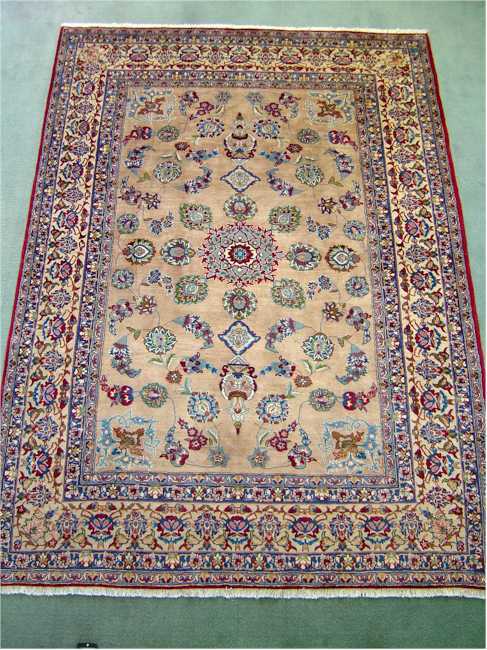 Currently Yazd carpets have a lower knot count but overall the quality is much higher. 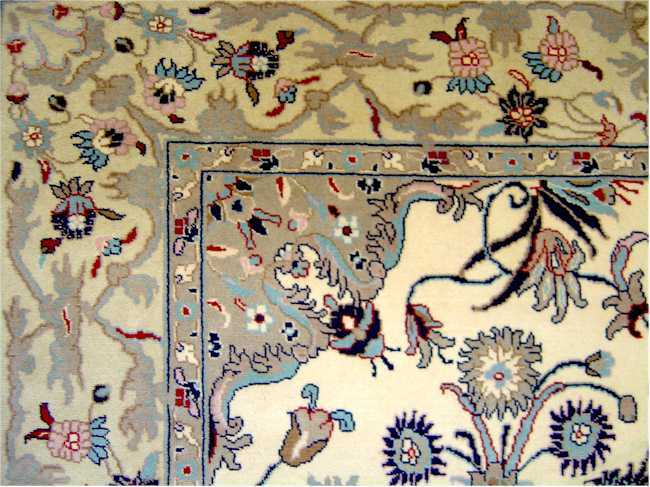 Carpets for export are generally in soft pastel colors. 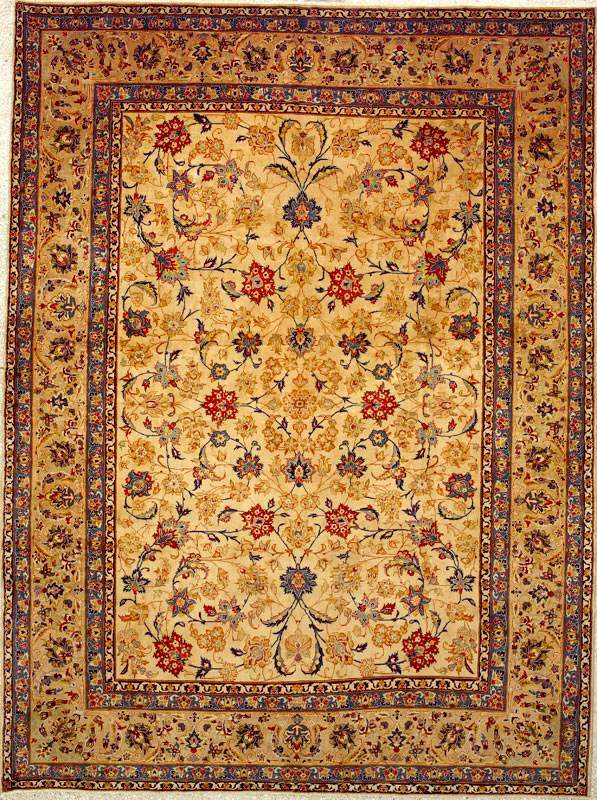 However Yezd carpets are extremely popular in Iran for domestic use. 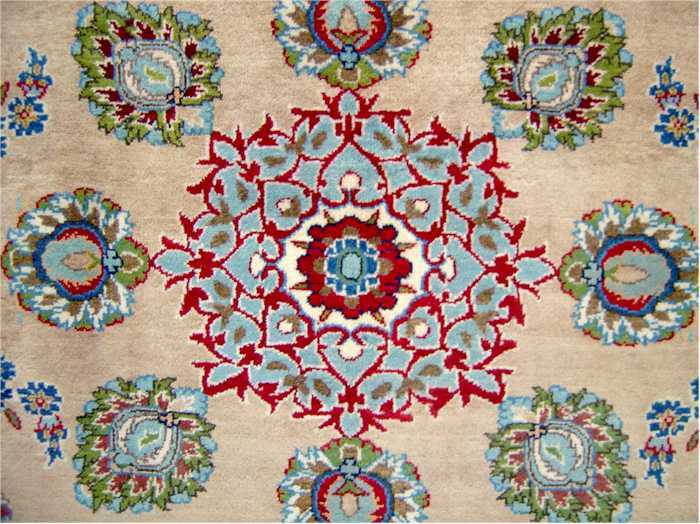 The rugs for the Persian home market have very bold colors. 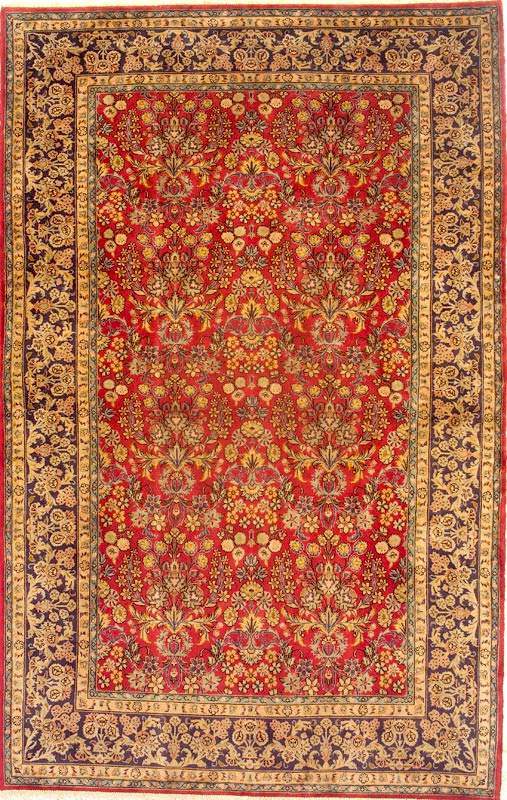 The carpet on this page is in the Persian style with a strong bluish red and an overall bold appearance. 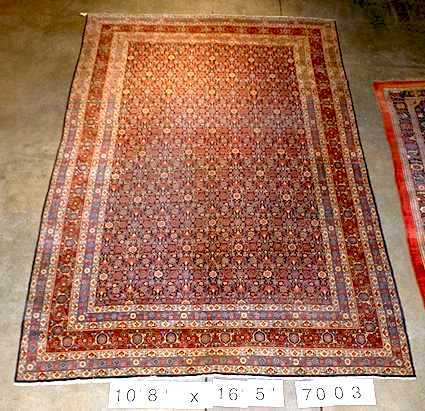 Size: Most rugs are from 8 x 10 to 11 x 16. Structure: Asymmetrical knot open to the right. 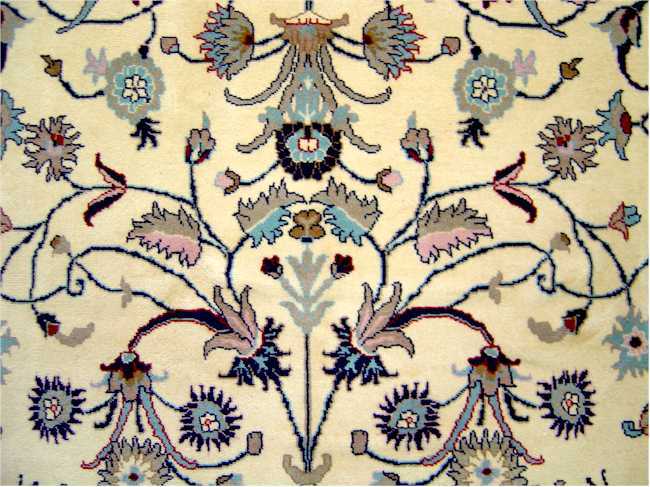 100 to 170 is normal in carpets with some pieces up to 250 knots per square inch. Ends: Overhand knots with warp fringe. Selvages: Multi cord overcastting wool. 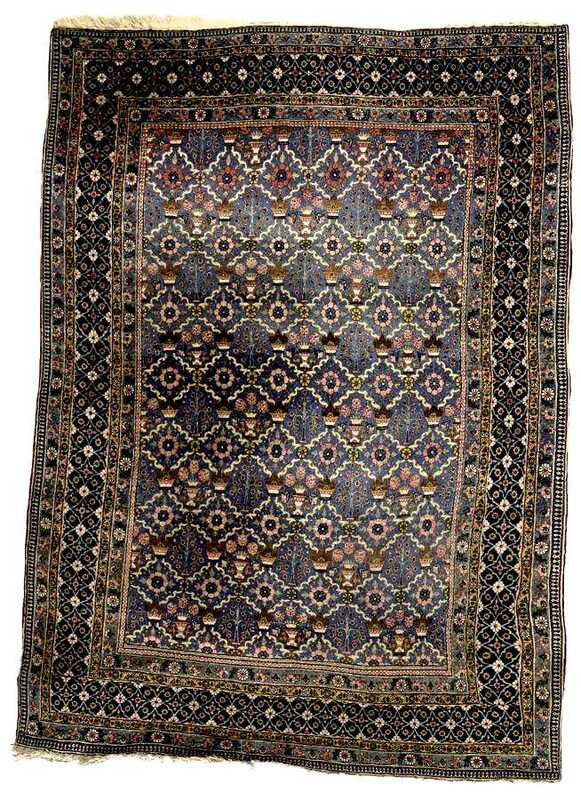 Borchalu may resemble Yezd rugs but are single wefted. 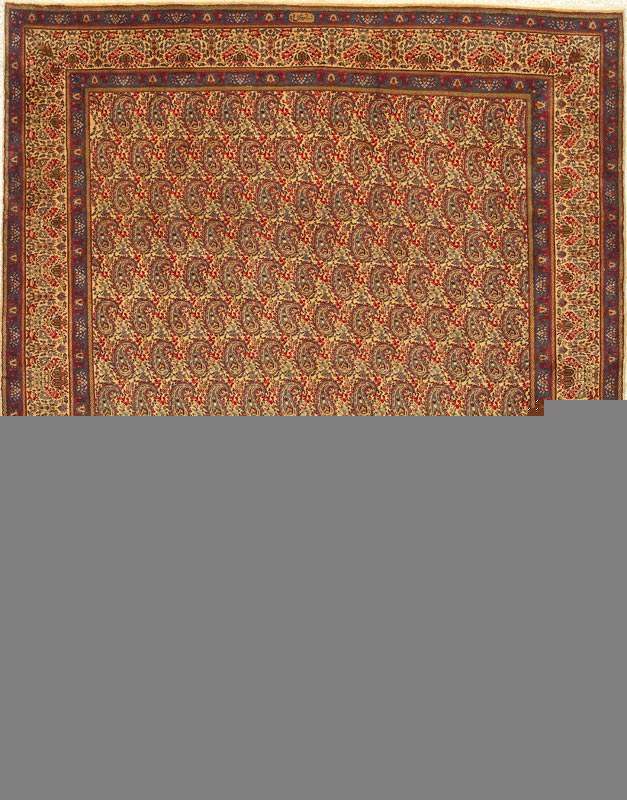 Kasmar rugs from Khorasan may look like a Yezd but are more flexible with finer warps and wefts. Size: 7 foot by 10 foot 4 inch. 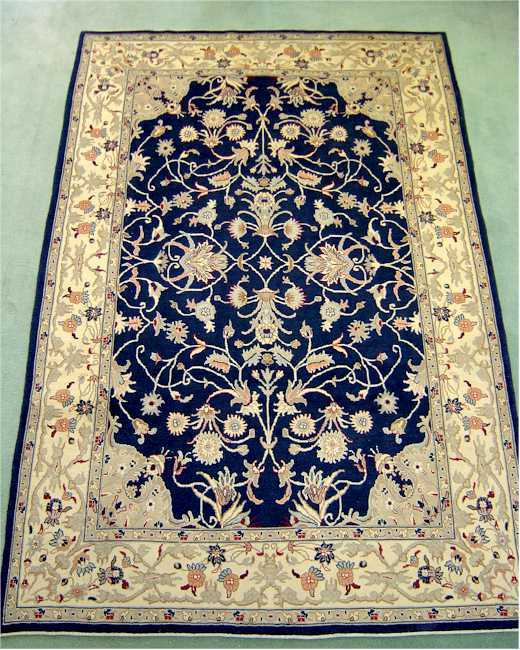 This is a fantastic Classical Yezd Carpet. The quality is outstanding and the carpet is beautiful. This is a Yezd Carpet. 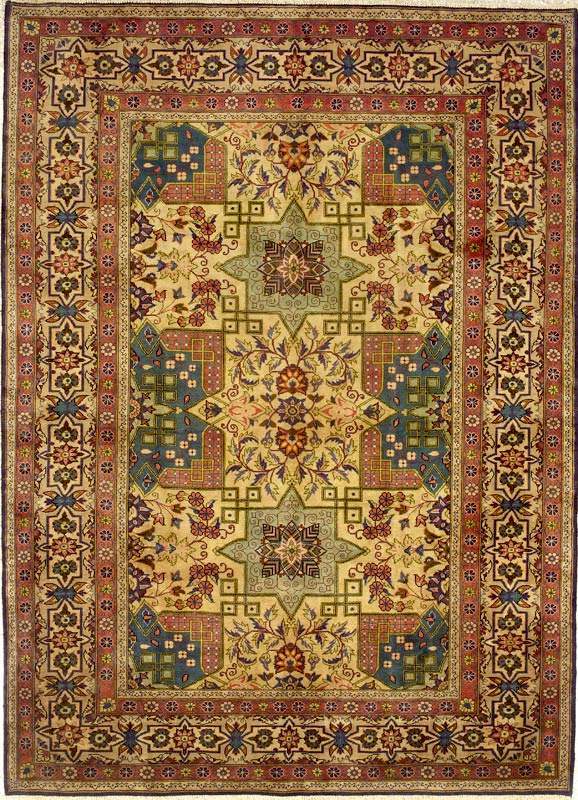 Similar in the style of the very best modern Kerman but it is distinctively a Yezd and has the much sturdier and hardier weave that we see in Yezd carpets. 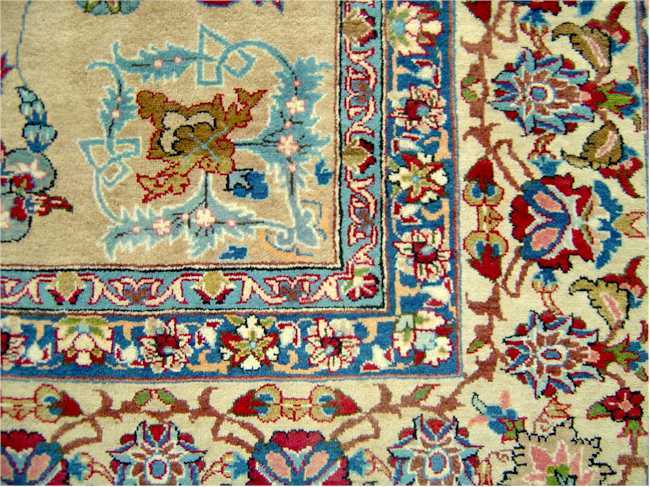 Yezd is one of the old carpet production centers in Persia. 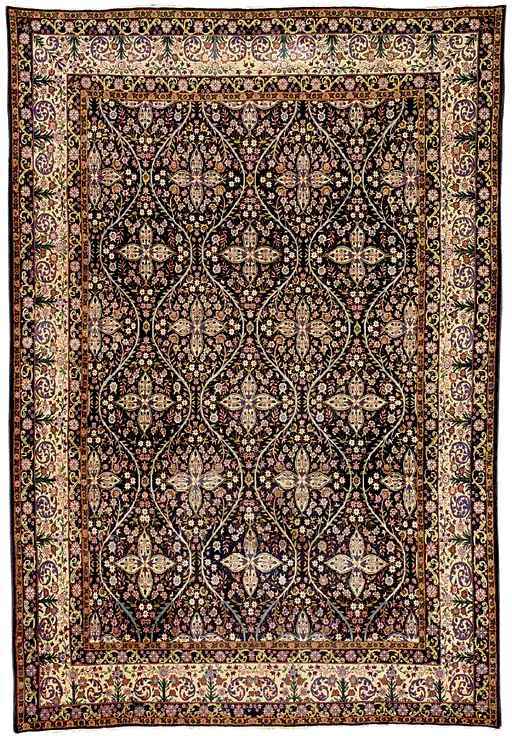 In the sixteenth century Yezd was famed for making the best silk and gold rugs. 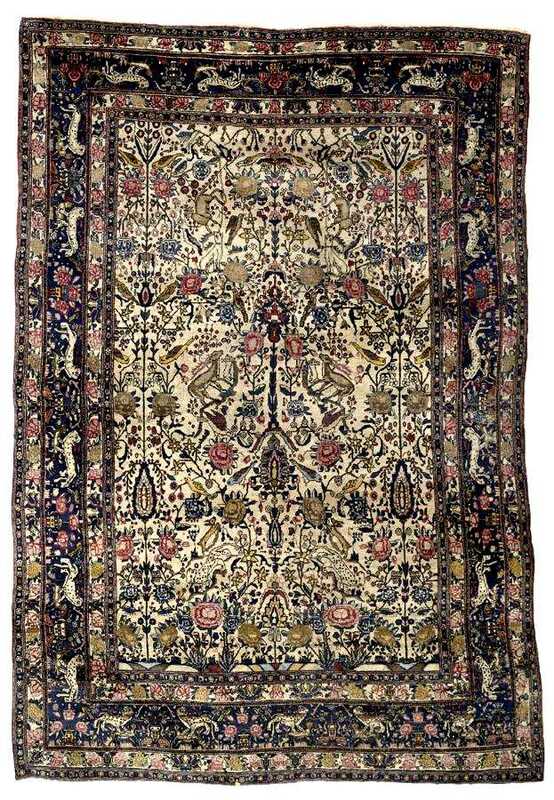 Many rugs in the classic period attributed to Kerman and Isphahan are no doubt actually from Yezd. 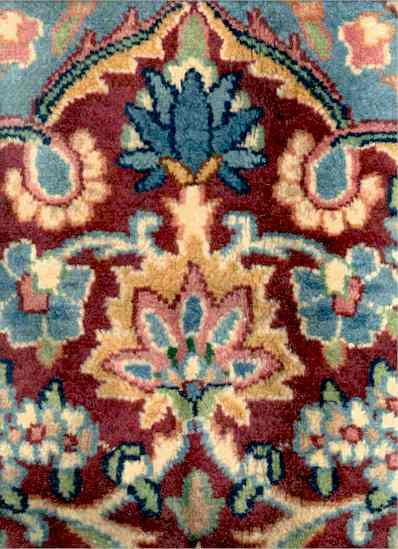 After the Afghan invasion the production shifted to wool rugs. 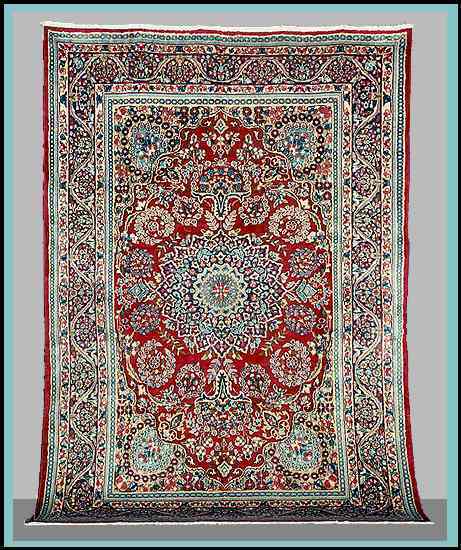 This one is a carpet from Yezd Iran. It is hand-woven and about 20 years old but it is in "as new" condition. Weft: 2 shots ivory, pink cotton. Selvages: 4 cord overcastting raspberry wool. This is an extremely sophisticated Yezd Carpet. The quality is outstanding and the carpet is beautiful. This is a Yezd Carpet. 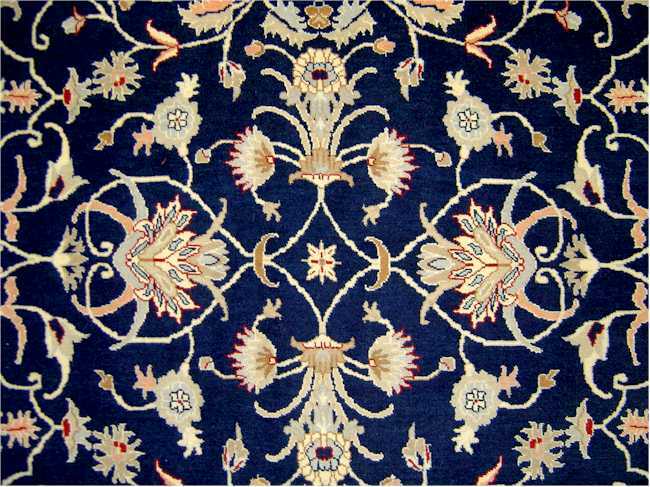 This is in the in the style of the very best modern Kerman but it has the much sturdier and hardier weave that we see in Yezd carpets. 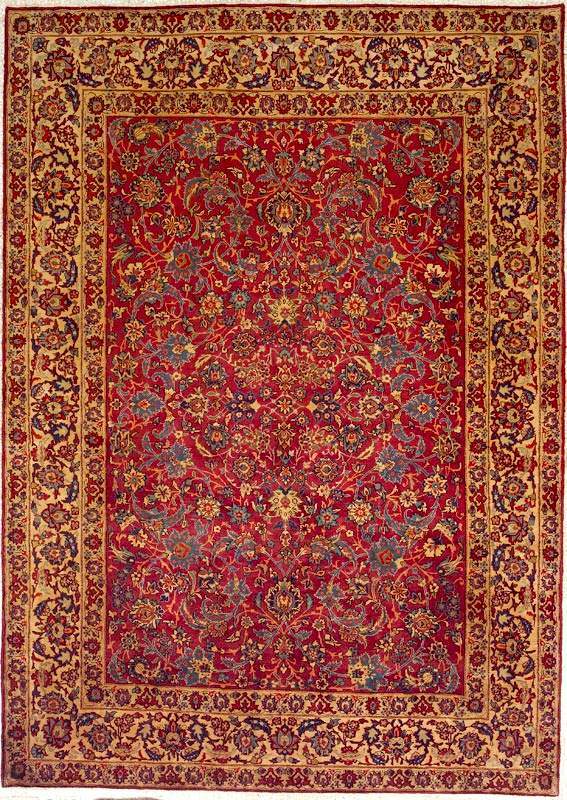 As I note I like the style many of the Kerman carpets. 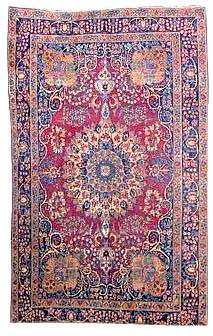 However in the second half of this century the Kerman weavers cheapened the weave by using false rug knots which gives a lower quality rug. 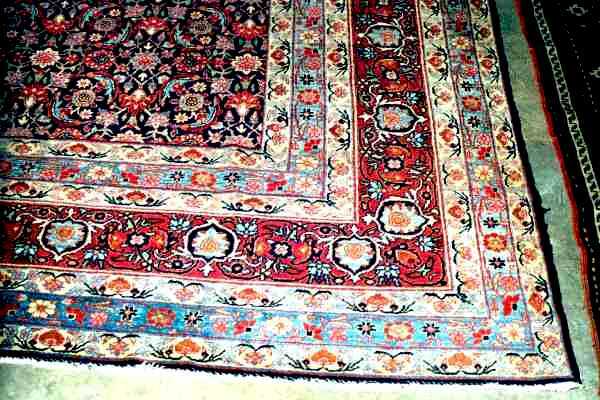 Carpets from Yezd which is Northwest of Kerman makes rugs in Kerman styles but the weave is true. 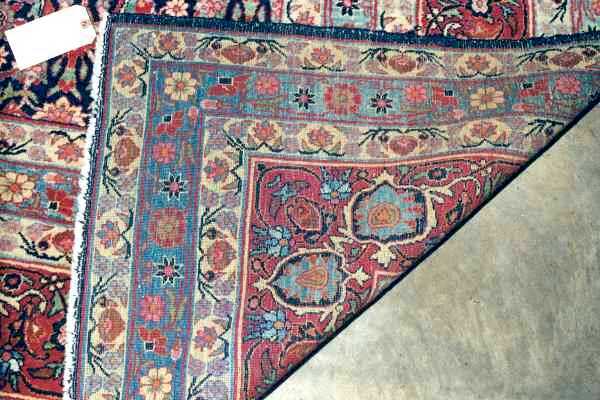 Please do not confuse these with the carpets made in Kerman. Colors: Burgundy, sky blue, cadet blue, mint green, chartreuse, midnight blue, ivory, peach, gold, salmon, brown. Weft: 2 shots sky blue cotton. Selvages: 6 cord overcastting raspberry wool. Handle: Heavy, soft wool, durable, dense, thick pile. The city Yazd is located in central Iran, halfway between Kashan and Kerman. 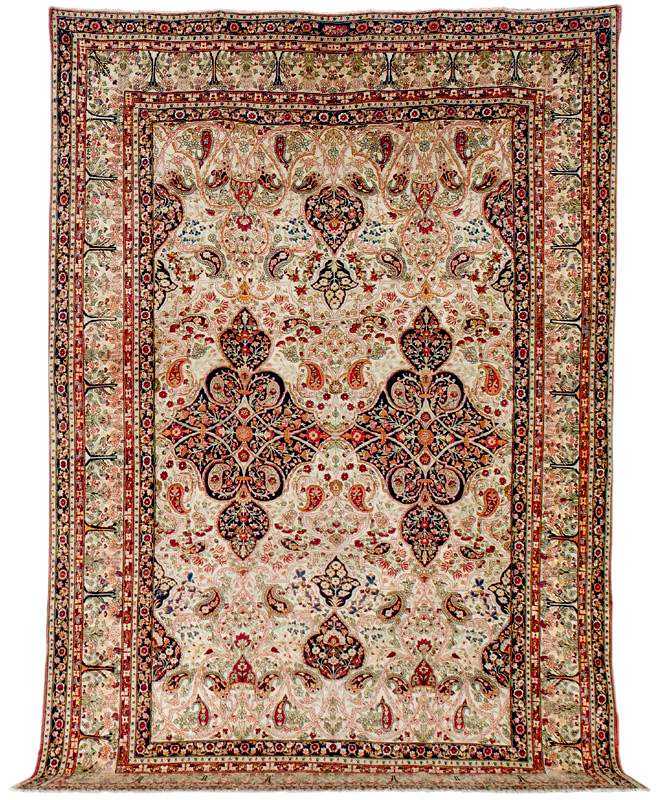 Yazd rugs usually have a single floral medallion in the center. 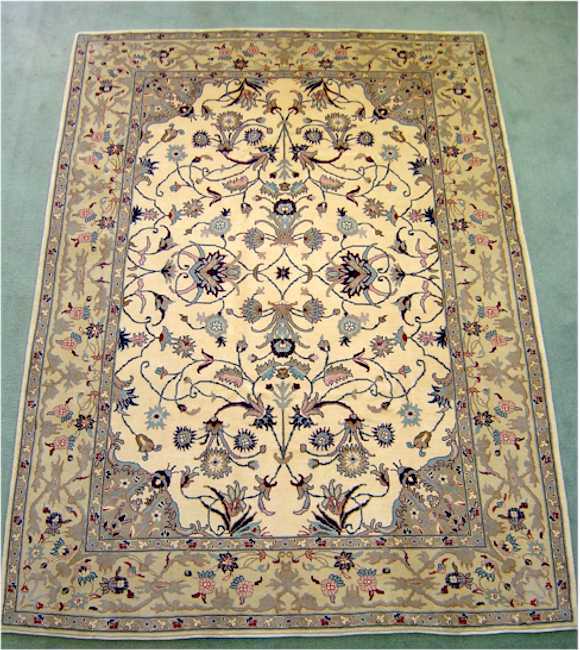 In design, these are very similar to the rugs of Kashan. The two are often indistinguishable. 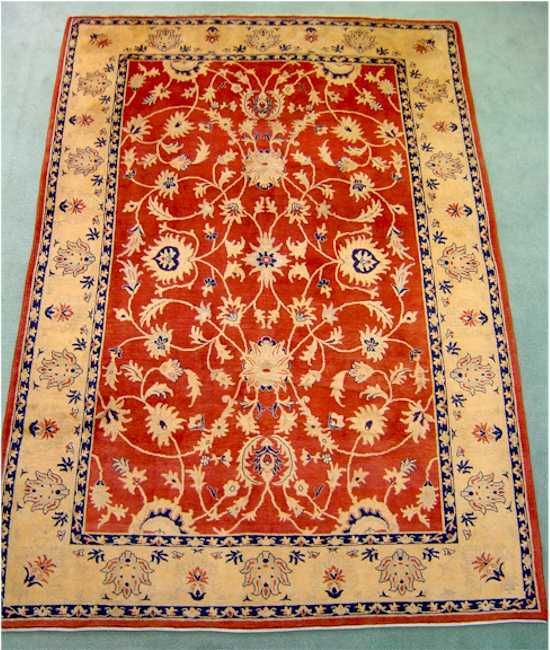 These rugs are usually multicolored, meaning they have more than twenty colors, but they include mostly red, navy blue, and beige. 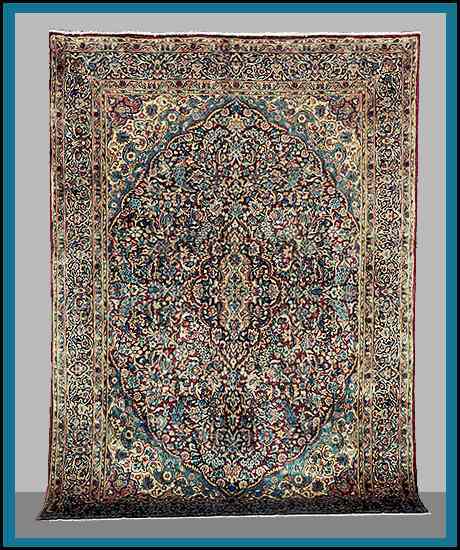 Yazd is an ancient city of central Iran which has been producing important carpets for at least four hundred years. It was the site of one of the earliest royal workshops of the Safavid Dynasty. 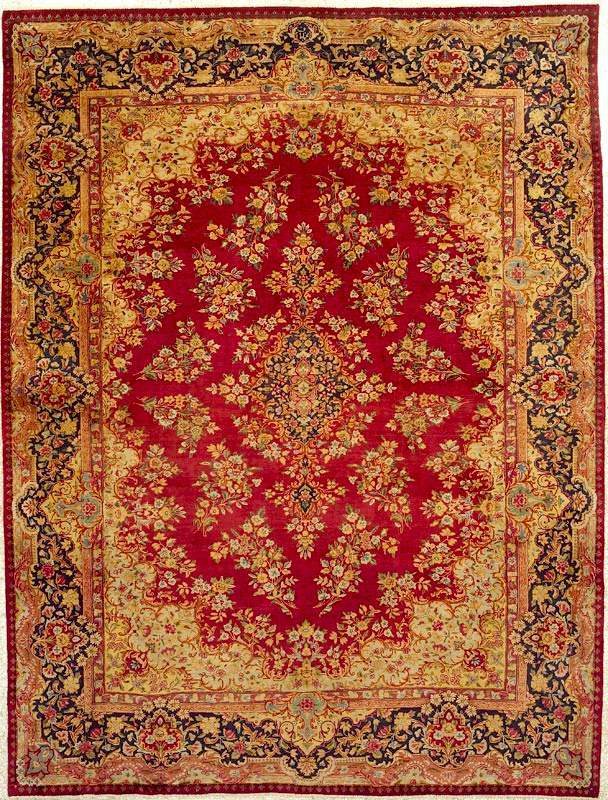 Yazd carpets have great resemblance to those of Kashan in style and construction because of their geographic proximity. They are often mistaken one for the other and sometimes require expert opinion to tell the difference. Note the midnight-blue field with an overall lozenge lattice containing individual flowerheads surrounded by floral sprays, in an ivory floral spray, scrolling acanthus leaf and delicate vine border between midnight-blue flowerhead and scrolling vine and floral meander minor stripes, even overall wear, and scattered areas of repiling. This panel would originally have formed the knee to ankle section of one trouser leg from a Zoroastrian woman's wedding costume. 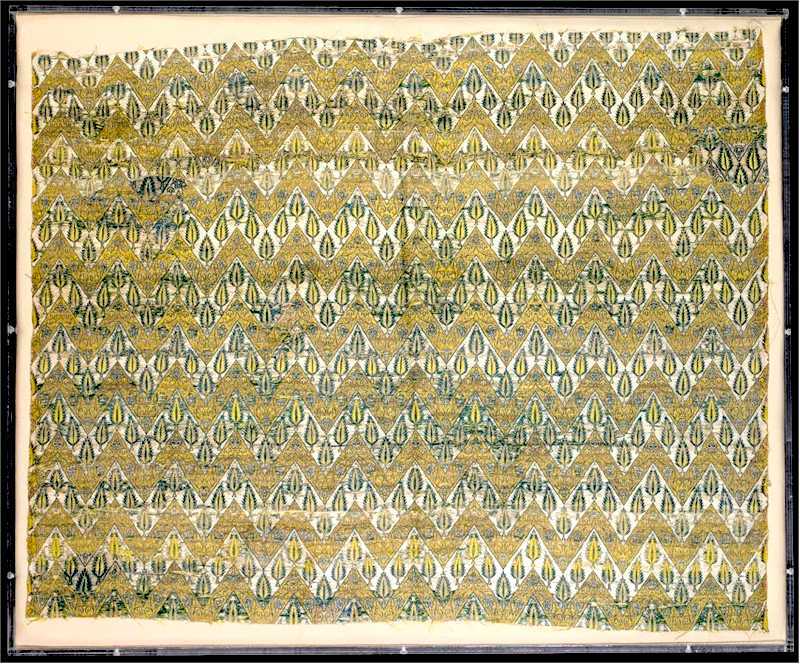 Description: Rectangular form woven in yellow, cream, and green with horizontal registers of alternating chevron bands filled with cypress trees and flowering vine. Description: Note the central field woven with an elaborate sunburst medallion, extended on two ends by a palmette and surrounded by bouquets of small flowers, the corners of the field each woven with a cartouche centered by small flowers and elegant "C" scroll vines, inside a primary border of palmettes and bouquets of small flowers and two secondary borders of meandering flowers. all in deep cranberry, navy, ochre, creme, medium blue, and pink. Wool pile on cotton warp. Condition: All over wear due to age. Selvage worn, but secure. White warp threads exposed in some spots. 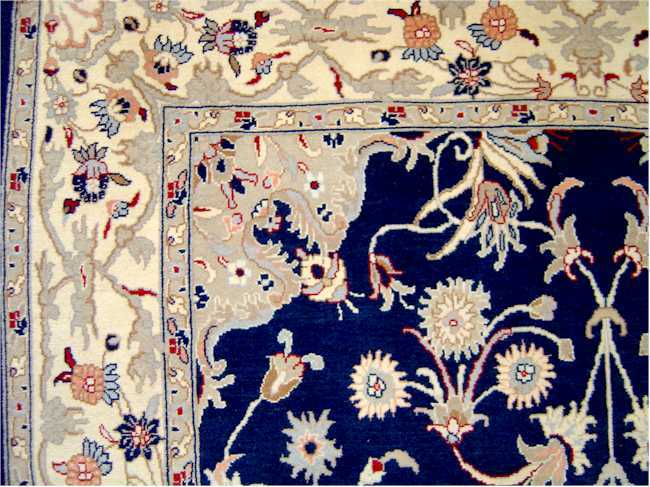 Other Notes: This carpet is woven with a light blue weft which gives it a beautiful overall blue hue. Other Notes: There are some low spots on this carpet, but it is not threadbare.